After blatantly copying Snapchat’s Stories to its own image sharing platform Instagram last year, Facebook extended the feature to other platforms including its own website, Messenger and WhatsApp. While Stores on Instagram and WhatsApp were an instant hit, the same can’t be said about Stories on Facebook and Messenger. Now, according to a recent report from TechCrunch, the company is testing three changes in an attempt to increase the uptake of Facebook Stories. The Facebook Stories composer on mobile will now show an open camera window featuring the most recent images taken on your device. This is expected to prompt users into sharing more Stories on the platform. The change is currently being tested with a small subset of Facebook users around the world. The second change, which might turn out to be a bit annoying for some users, redirects users to the Stories section directly from the augmented reality camera as soon as they click share after taking an image. 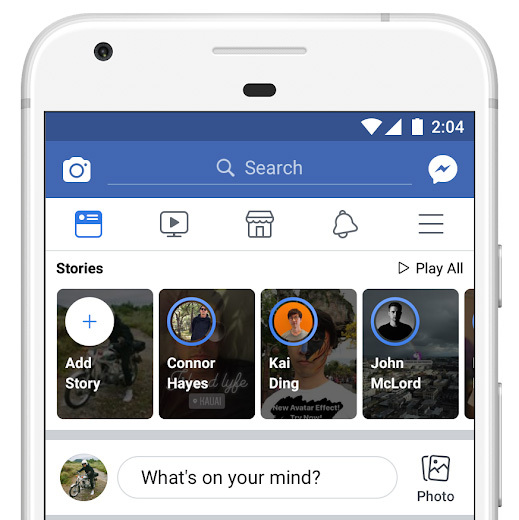 Previously, users had the option to choose if they wanted to post the image to Stories, News Feed or send it to a friend via messenger, but with the change Facebook will actively nudge users to choose Stories over other options. The change is currently being tested with all Facebook users in the Dominican Republic. The third and final change is the biggest change out of the lot. The Stories section above the News Feed on Facebook will now show large preview tiles behind the smaller profile pictures of the users who created the Stories. Facebook believes that teasing what’s inside Stories will prompt more users to click and watch the entire Story. This change is being tested with a small percentage of Facebook users around the world. In case the changes receive a positive response from users, Facebook might roll them out to more regions. What do you think about the Stories changes? Would they prompt you to use Facebook Stories more often? Let us know in the comments section below.